Rogaine/Regaine was developed from the oral high blood pressure medication Loniten. One of the side effects was increased new hair growth on areas of the scalp that had been balding for a long period of time. It comes in the form of a lotion which is applied to the scalp twice daily and is odorless, as well as colorless. The Upjohn pharmaceutical company started tests on Minoxidil on bald heads with very positive results. Although Regaine was officially made available in 1988, the drug minoxidil was already approved by the FDA as a prescription in pill form. However, this side effect also affected different parts of the body with unwanted hair growth. It has been proven clinically effective in the prevention of loss and also in establishing varying success of hair re-growth in both males and females suffering baldness, with around about 40% of men experiencing hair regrowth after 3-6 months. This condition of extra hair growth was called “hypertrichosis”. The main ingredient of Loniten is Minoxidil. In 1988 Upjohn Corporation produced a topical solution that contained 2% Minoxidil to be used to treat baldness and hair loss, under the brand name Rogaine in the United States and Canada and Regaine in the UK. 1992 Rogaine for women launched. 1996 Rogaine is available for over the counter use. 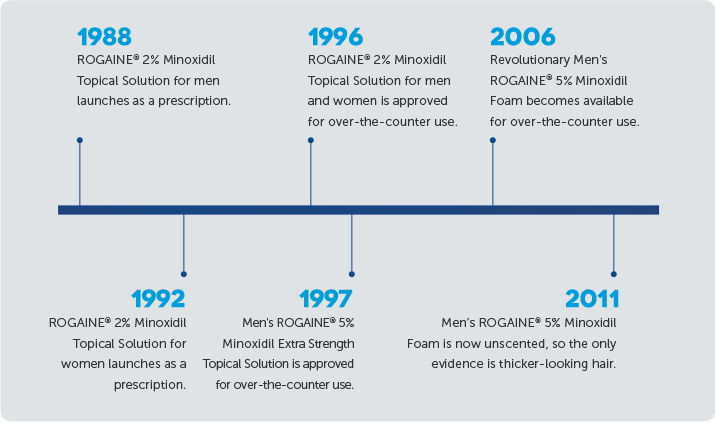 In 1997 5% Rogaine Extra Strength topical solution for men is approved for over the counter use. 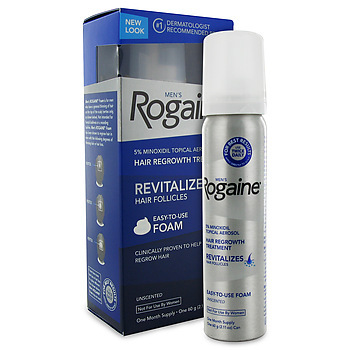 In 2006 Rogaine Foam is launched. 2014 Rogaine for women foam launched. Rogaine is generally well tolerated, but common side effects include burning or irritation of the eye, itching, redness or irritation at the treated area, as well as unwanted hair growth elsewhere on the body. Side effects of Rogaine can include swelling of the face and extremities, rapid and irregular heartbeat and lightheadedness. While the Rogaine/Regaine is available in the United Kingdom, it cannot be prescribed on the NHS, so patients must either buy it over-the-counter or have a private prescription for it. Rogaine Treatments usually include a 2 % and 5% solution that is designed for men and a 2% solution for women.